It's been a while since we've seen any truly new graphics architectures from ATI or NVIDIA. G7x and R5xx GPUs have had quite a long lifespan, dating back to almost 12 months ago for ATI and 15 months for NVIDIA. When you consider that the G7x architecture is really just a refinement of NV4x (similar to how R4xx was a refinement of R3xx), we could even say that NVIDIA's current architecture is almost 2 1/2 years old! That's practically an eternity in the world of GPUs, where for a while we were seeing new architectures every 18 months or less. Things seem to have settled down a bit in terms of architecture progression, but the war for the fastest GPU(s) certainly hasn't tapered off. During the past two years, we have seen the introduction of SLI and CrossFire as ways to eke more performance out of the current architectures. NVIDIA has lately taken that a step further with quad SLI configurations, or cards like the 7950 GX2 which feature "SLI on a single card". If we were to conservatively estimate the number of variants of the different graphics cards that have been launched in the past two years, it would certainly be over 40. This proliferation of GPU models has been done in an attempt to target all of the various price points, from the $50 budget cards all the way up to the $600 super cards. Microsoft seems intent to get in on the action as well, as Windows Vista will launch with nine different variants at last count. We bring up Windows Vista for more reasons than one. With Windows Vista will come the launch of DirectX 10, bringing with it an expanded feature set and improved performance. In order to fully support DirectX 10, however, NVIDIA and ATI need to do a decent amount of work on new architectures. This work takes time, although with the delays of Windows Vista perhaps that isn't a bad thing. We expect to see new graphics architectures from both ATI and NVIDIA either late this year or early in 2007, just in time for Windows Vista to start shipping. In the meantime, the battle for consumer dollars wages on. In order to keep filling in the gaps, improving value, and competing, NVIDIA is following ATI (who followed NVIDIA...) in releasing another run of rebadged graphics solutions. The two new solutions are the 7900 GS launching today, with the 7950 GT scheduled to launch next week. NVIDIA is targeting the $200 and $300 price points (respectively) with these new offerings in two different ways. For the 7900 GS, NVIDIA is disabling vertex/pixel pipelines, while the 7950 GT will be taking advantage of the high overclockability of the G71 chips. Let's take a closer look at what will be offered with the new GPUs. Two new cards are making their debut today, but only one will be available as of this publication. 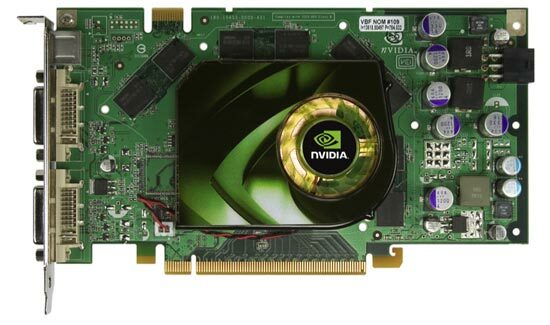 The card available today is the GeForce 7900 GS, for which we will also be able to talk about performance. We will have to wait at least a week for the second part of this two part series to talk about the performance of the other new part: the GeForce 7950 GT. The GeForce 7950 GT will be available on September 14th. Don't be confused by the 7950 moniker: the 7950 GT is a single GPU solution that is slower than a single 7900 GTX. NVIDIA intends for the GX2 postfix to indicate a dual GPU solution, and those who don't do their research might think a higher marketing number means higher performance. GeForce 7950 GT is a horrible name for this card no matter how we slice it. The plan is for this new card to compete with the X1900 XT (512MB) and highly overclocked versions of the 7900 GT, at a price point above $300 USD. For today's tests, we will have to make do with only the GeForce 7900 GS. This card will come in between $200 and $250 and compete directly with the X1900 GT. Until now, as we saw in our earlier midrange roundup, the X1900 GT had no direct competitor from NVIDIA at its current price point -- at least if you're talking about MSRPs and prices without mail-in rebates. At present, the X1900 GT is selling for $225-$245, with street prices of the 7900 GT ranging from $262-$312 before rebates, depending on clock speed and features. With rebates, 7900 GT cards can be had for as little as $236. That puts the 7900 GS in an interesting position, as it will need to compete with not only the ATI offerings, but it will also have to go against some of NVIDIA's own products. The 7900 GS will certainly have to fall closer to the $200 price point rather than the $250 price point if it is to be successful. Both companies have some other products falling close to the $200 price point. ATI offers the X1800 GTO, and you can sometimes find X1800 XL and XT cards carrying similar prices. Availability of some of these parts is sketchy at best, so they are not the primary focus of our current GPU articles. NVIDIA also offers 7600 GT cards ranging in price from $167 ($132 with MIR) to $219. Depending on the performance the 7900 GS offers, we may see 7600 GT prices drop in the coming weeks. This is obviously a crowded market, and NVIDIA is absolutely hoping that the 7900 GS (and factory overclocked variants) will be able to reclaim the performance and value lead at this very important price point. It is somewhat interesting (humorous?) to note that NVIDIA's literature compares the 7900 GS to the X1800 GTO, which obviously isn't the right comparison to make. Of course we will be running our own performance tests, and in our attempt to discover whether or not NVIDIA has succeeded in recapturing the lead of the mainstream $200 segment, we have an XFX 7900 GS that we will run through our benchmark suite. really grates me! I know it's pretty endemic but it's still logically incorrect. A price tag can be lower of higher, but not cheaper, unless it's the price tag being sold. It's the product itself that can be cheaper. ...the latest ATI OpenGL enhancements that have drastically improved Doom 3 engine based game performance. Of course, not all OpenGL games faired well with the latest round of drivers from ATI, with City of Heros/Villains performing very poorly in spite of its use of OpenGL. ...but it seems ATI has finally solved their OpenGL performance issues -- at least with this particular engine. found an XFX version on this card on newegg for 189MIR.